Experience Go Kart Racing at Boomers Palm Springs to satisfy your need for speed with fast turns, blazing speeds, and hair-in-the-wind fun! Find out our Go Kart rules, restrictions, and unbeatable prices here! Boomers Palm Springs offers the best outdoor Go Kart track in Palm Springs! The quarter mile track features hairpin turns, banked curves, and straightaways that make it easy to pass your friends and family. Each go kart session runs for five minutes. Boomers Palm Springs offers both single and double seater Go Karts. Get your heart racing on the Go Kart Track at Boomers Palm Springs! 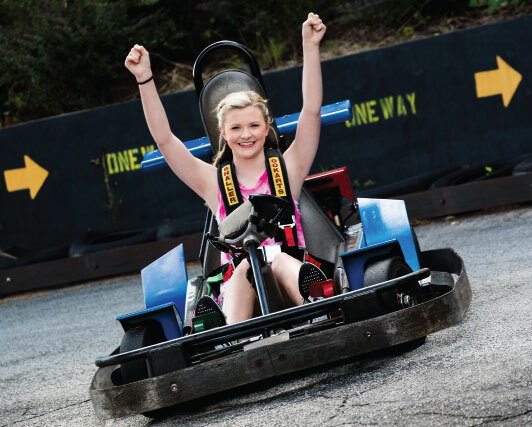 Race against your friends and family on our high speed Go Karts, which are perfect for speed and adrenaline junkies. Test your driving skills through the hairpin turns and passing your competitors on the straightaways. Boomers Palm Springs Go Kart Racing will fill your need for speed! Boomers Palm Springs offers unbeatable low prices. Bring your online printed ticket to the Cashier when you arrive at Boomers Vista to redeem your online voucher.